If see around with seek and observation around this world we will see all creatures are living for others. every bit around us take us to its purpose and non is purpose less this is only us who are not aware of things and their purposes. A human being is superior to all creatures and it seems all creatures are created for human being. as Human being is unique in all of them in creativity and capabilities and have a soul. For human being who understand all creatures around and their purposes. and once a person understand purposes of all creatures he eventually understood reason of its own creativity. A human have to seek ways by see, hear, think, listen, smell, observe with skill read, write, speak and share the knowledge. About Creature like sun, river, trees, and flowers their creativity is wonderful with ways of fucntionalities lead us to creativity of human being in ways. Many system around us follow the same fashion of creativity. Mammals or non mammals and branches of knowledge that make us understand these creativity of creatures. They all follow similar ways. Planets gigantic or tiny or living organs/animals tiny or gigantic all are created by Creator. So much to know and to seek but non is purpose less and about orders and cycles as you said of tree,river, sun and flower there are numerous signs for people who understand and do seek to know the truths of this Universe and Creator of this universe and His Creativity. As a matter of fact in history there is not a good fame for the people who lived for them. The people who lived for others got the fame for centuries. 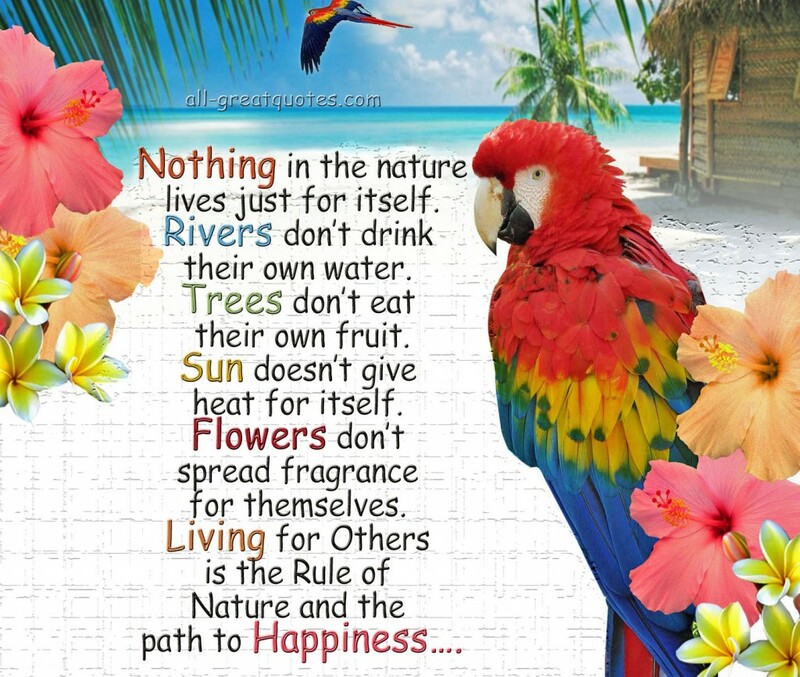 "Living for others is the rule of nature" and the path to Happiness, all nature is created for a purpose.